Hewlett-Packard (HP) will pioneer the launch of Intel's Ultrabook-concept notebooks, even ahead of the planned release of the Asus UX21 Ultrabook (slated for September 2011). HP is expected to launch two or more models of Ultrabooks initially, using Intel's Ultra-thin Core i7-2677M (1.8GHz) and i7-2637M (1.7GHz) dual-core CPUs, according to sources at Taiwan-based suppliers cited by DigiTimes. HP is at least initially outsourcing production to Foxconn Electronics (Hon Hai Precision Industry). The factory has already begun shipping the Ultrabooks to HP. Both companies of course declined to comment. Two months ago, Intel unveiled design guidelines for the Ultrabook. Earlier this month, we learned that the company is paying first-tier notebook vendors to develop Ultrabooks. It's not clear how much HP is getting to lead the charge for Intel. The goal for the Ultrabook is to combine thinner and lighter form factors with tablet-style features such as touchscreens and near instant-on capabilities. Ultrabooks are supposed to less than 20mm (0.8 inch) thick and cost less than $1,000. In the next 18 months, Intel is hoping to eventually have really thin, really responsive systems down to truly mainstream price points of around $600. The first wave of laptops adhering to the Ultrabook specifications are supposed to arrive in time for the 2011 holiday shopping season, and Asus, one of the initial launch partners, was thought to have have the first device. Now it looks like HP is not only a launch partner, but will actually beat Asus to the punch later this year. 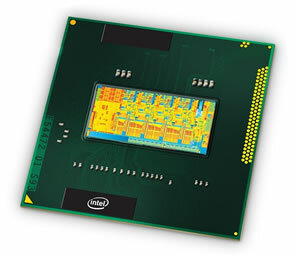 A second wave of Ultrabooks will appear in the first half of 2012, based on Intel's upcoming Ivy Bridge processors. Intel hopes to reach its goal of mainstream prices at some point in 2013 with a new Core processor design, codenamed Haswell, which will half the power consumption of Intel chips compared to today's laptops, enabling thinner designs and longer battery life. By that time, the chip giant expects as much as 40 percent of laptop shipments will be in this category.